Okay, fair enough. Inventory levels are down year after year. "What about the demand side, what about sales," you might ask? Understand, that the number of homes sold (single family homes in the City of Boulder) tends to vary more dramatically than the number of homes in inventory in any given month. This is true both month to month and year to year. However, a trend can still be teased from the chart below. Despite having greater dollar volume, 2005 trailed 2004 in the number of homes sold, except in February, March, and August. 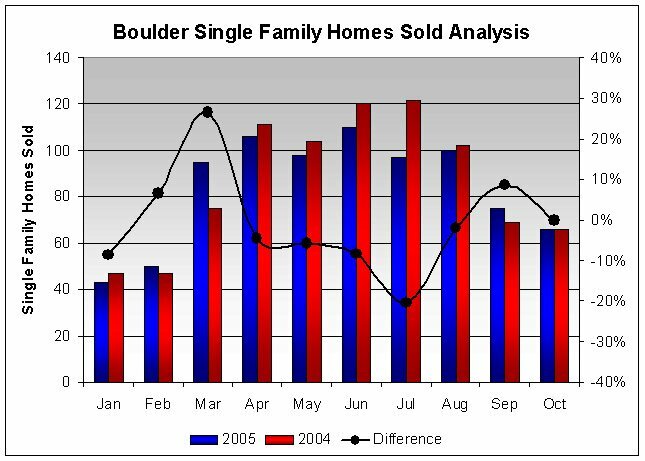 In some cases, this was quite dramatic: There were nearly 21% fewer single family homes sold in the City of Boulder in 2005 than in 2004.